The newly constructed Agriculture park in Wana, the regional headquarter to South Waziristan is kickoff to functional. The park will play an important role to boost Agriculture business after peace back to South Waziristan. The newly agriculture park is socioeconomic uplift programme for Tribal districts of Khyber Pukhtunkhwa. The park is not only facilitating locals but also open ways for the central corridor with Afghanistan and neighboring countries. ALam Khan Mahsud, 25, is an owner of a vegetable shop in local market of headquarter city of South Waziristan. He facing problem and calling hiatic day when he goes to Tank about approximately 60km away from main city of South Waziristan to brought fresh vegetable for his shop. “It’s one of the long processing day to go to open market in staled area and bring vegetable for own shop. It’s not just hiatic day but also consumed time and inflation in price, Mahsud added. After functional this project, the local shopkeepers find a way of hope for the availability of vegetable on daily basis at their door steps. He said “After opening such project this could help to bring fresh vegetable, consume time and most all vegetable provided to all on government rates. The park is one of its kind in the region which contain market complex, five warehouses, Bank, Hotel, Pine-Nut plant, Hawker Sheds, cold storage and other structures. The Mega project will host 50 kind of business in which 703 people will get employment while 1038 people will facilitated as labor from local populace. Mujeeb Ur Rehman, 45, is a contractor in Agriculture Park Wana. He elaborate the project and call it the new phase of Waziristan. He said “This is one of the good project for the rehabilitation of locals as the area was a home to war in terrors from last decade. He said that “it will help locals to stand on their feet’s after intense operations and Terrorism. He elaborate that “we have one of the best Pine Nuts and Fruits, across the border Afghanistan and Federally Administrative Tribal Area (FATA). This project will be hub for the Agriculture business which will benefits the country’s economy. He suggest to the government to launch such kind projects in other part of the newly tribal districts as well. “Government should need to construct such kind of Projects which will help economy of the country and most an opportunity for locals to contribute in Agriculture and other sector, Rehman added. The region contribute 29 % (11,372 Tons) in Pakistan’s vegetable production which 73 % s Bitter Gourd, 40 % Brinjl, 33 % Tomatoes and 21 % is Lady Fingers while the Fruit capacity is 71 % (70,043 Tons) in which the production of Allple is 92 %, Almond 82 %, Peach 40 % and Grips is 37% of the region. This Structure of this project dabble the beauty of Waziristan, say’s Muhammad Gulab Wazir, a local elder of South Waziristan. He said “This project is ray of hope for local production in Agriculture sector along with local Pine Nuts in the region. 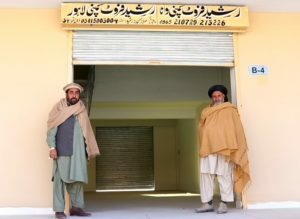 “Before the region don’t have such systematic business of agriculture sector but after this it will benefits locals along with business in South Waziristan, Wazir added. 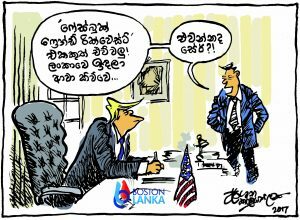 He calls the project one of the attractions for others in bossiness sector. He said “Such kind of facilitate in Park will attract local and increase in business opportunity in the region”, Wazir elaborate. The security situation in KP and newly merged districts had registered improvement in 2017 and along 50 per cent reduction in number of terrorist incidents. As a result of the improved security situation climate for the investment of international businessman had also shown improvement. 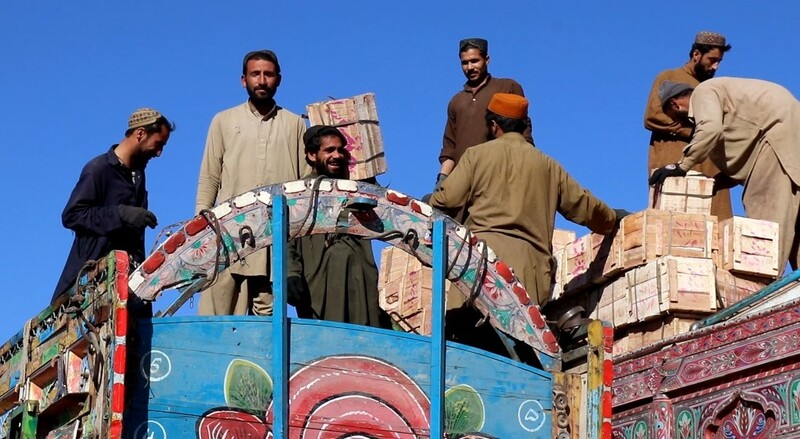 Among like many other, Gul Mar Khan, 35, is a truck driver, brought a loaded truck with Pine Nuts from Afghanistan. He calls the project as facilitation for the truck drivers across the borders. “Such park for agriculture on a few hours way from Angoor Adda in South along with Ghulam Khan in North (Pak Afg Borders) is not only facilitation to the drivers came across from Afghanistan but also a wave of relief and attraction for business of two neighboring countries Afghanistan and Pakistan”. He mentioned the bad old days of the region as worse nightmare for the business. 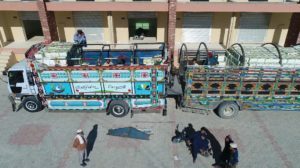 “Before we take these Pine Nuts to the other part of Pakistan which make the cost dabble and most the life of the trucks get to its worse due to such long rotes”, Khan added. After opening the Agriculture Park, he marked the year as most profitable year for the businessman. “Before I took these Pine Nuts to Peshawar in which the profit ratio was 30,00 to 3,500 US dollars per month but this year the ratio increase to 6,500 US dollars profit and it’s all about Agriculture Park in Wana, Khan mentioned.